Every time Mr. Harold Bell wrote, he asked me to come and preach the gospel to Hispanics in West Phoenix. I politely declined – repeatedly. But, “the effectual fervent prayer of a righteous man availeth much” (James 5:16, KJV). In the summer of 2000, while living in Detroit, we began to pray for an open door in a new work in Spanish. That fall, Tim McCauley and Ross Vanstone contacted me about having a distribution of Seed Sowers Bible posters in a southwestern city at the end of the year. At that moment, my wife reminded me of Mr. Harold Bell. In December 2000, I spent four days with brother Harold scouring West Phoenix for a place to rent. Prices were outrageous and we were left with two possibilities: to use the Bethel Primitive Baptist Church building that appeared to be in disuse, or to curtain off a section of Aqua Spa, the spa cover factory owned by Paul and Jon Vizzini of the Sunnyslope assembly. The Baptist church trustees soon informed us that they would not rent it, only sell it to us. With essentially no contacts, we went with Plan B – meetings in Aqua Spa. The last week of December 2000, we had our first Seed Sowers distribution of 55,000 texts in Phoenix. Shad Kember and I then began a gospel series the first week in January. Truthfully, everything seemed hopeless! The meetings were in an industrial complex, and our only permitted advertising was in the evenings when Jon parked his truck with a banner by the entrance and shined a flashlight on it. To make matters worse, I realized too late that I had made the map on the 55,000 invitations upside down and backwards. However, eight adults attended the first night, and God began to work. During nine and a half weeks of meetings every night, the Christians in the Sunnyslope assembly were amazing. They came and watched children in Paul and Jon’s office so parents could listen. They also helped with transportation and brought cookies so we could chat with those who attended. They even collected clothes that we distributed to needy families. To our amazement, God began to save souls, and by the end of the series, it was apparent that we needed to move to Phoenix. Shad and I took turns in Phoenix and more souls were saved and baptized. In July, Michelle and I and our four boys moved to Phoenix, and soon realized that we needed to have our own building for the meetings. A few days later, our real estate agent called to say she had found a church building for sale and the price had been lowered substantially. It was the Bethel Primitive Baptist Church. The Lord provided, and brothers from Sunnyslope helped us remodel it inside and out. In October 2001, we had our first gospel series in it and began weekly children’s meetings as well. In December 2001, we had another Seed Sowers distribution with meetings to follow, and more souls were saved. At the same time, we began to teach them about Christian living and church truth. None of the believers had seen an assembly, so we took a field trip one Sunday to observe the Breaking of Bread at Sunnyslope. 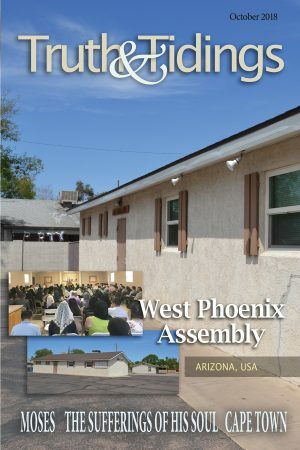 While they could not understand English, their observations and questions were encouraging, and it deepened their burden to have a Spanish assembly in Phoenix as well. At the same time, we prayed that God would bring in neutral help to evaluate the work, as I feared I might have blind spots. He did, and with the cherished fellowship of the Sunnyslope assembly, we had our first Breaking of Bread on September 15, 2002. Throughout the next year, we continued to work in the gospel. We used a variety of means to make contacts, including clothes distributions, medical clinics, English classes, immigration document assistance, etc., but the focus was always the gospel. God reached souls and added to the assembly through each avenue. Through those months, brother Shad visited regularly and was a huge help in door-to-door visitation. He and Debbie eventually moved to Phoenix, where they lived from 2004 to 2010 and were an immense help to the assembly. In December 2002, we had our third Seed Sowers distribution, which yielded another nice harvest. Souls were saved, including two men whom the Lord eventually raised up to be leaders in the assembly. One of them was Leonel Chavez who, along with his dear wife Ieimy, became active in evangelism. Eventually, it became evident to all in the assembly that the Lord was calling Leonel and Ieimy to leave Phoenix and serve Him full time in their home country of Mexico. While we still miss them, it has been a joy for the assembly to pray for them and support them as they have made their home in Guasave, Sinaloa, Mexico since February 2014. Over the years, God has saved souls in Phoenix and then given them a burden for their family members in Mexico. This has opened doors for gospel work and eventually assemblies in Chihuahua, Hermosillo, Ciudad Obregón, and Iguala, Mexico. We pray that this pattern might continue, and that the gospel will continue to flow through new believers in Phoenix to new areas of Mexico and other countries as well. In recent years, God has graciously allowed us to see growth in West Phoenix. A number of young people who have come to Phoenix for university studies have been a great help. At the same time, the Lord has reached more Hispanics through personal contacts, and even some watching messages on YouTube. These additions brought the very welcome problem of not having enough space in the hall. Thankfully, though, the Lord provided and, over the past six months, brother Kevin Procopio and others have helped us reconfigure the interior of the building, giving us more usable space. We are undeserving of the blessings God has given in West Phoenix over the past 17 years. It started with the exercise of one brother who didn’t even speak Spanish. Although many have labored and even more have prayed, we recognize that “God gave the increase” (1Cor 3:6). There are nearly 800,000 Spanish-speaking people here in the Valley of the Sun, so there is great potential for more souls to be saved and more assemblies to be established. For this, we would deeply appreciate the prayers of God’s people.